Mark Sundeen is a Moab Author. 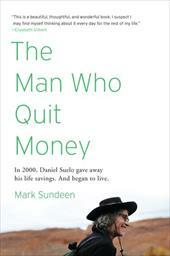 Titles include the Man Who Quit Money which profiles the life of Daniel Suelo who gave up his life savings to forage in the desert. The web site includes additional interviews and writings including videos such as the profile below. Ahem. I haven't completely given up quite yet. You can find this title at Better World Books and if you use my advertiser links, I could continue to pay for this web site and not have to take up one of the remaining caves near Moab. The American Who Quit Money To Live In A Cave from David Eckenrode on Vimeo.